This project was produced by 15 Finches, our startup focused studio. 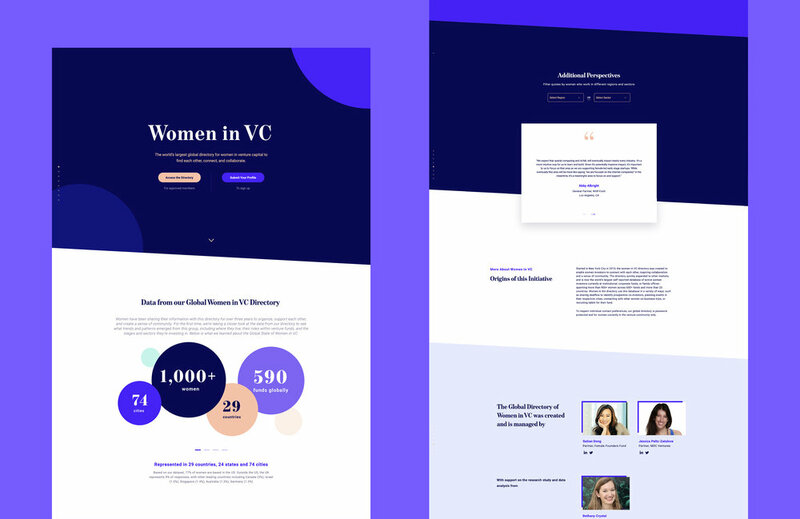 We were approached by the founders of Women in VC, a global directory of women in venture capital, to design and develop a website as an entry point for new and existing members of the network to access the directory on Airtable. The website also displays meaningful data collected through the database of self-reported entries of more than 900 women in VC worldwide. 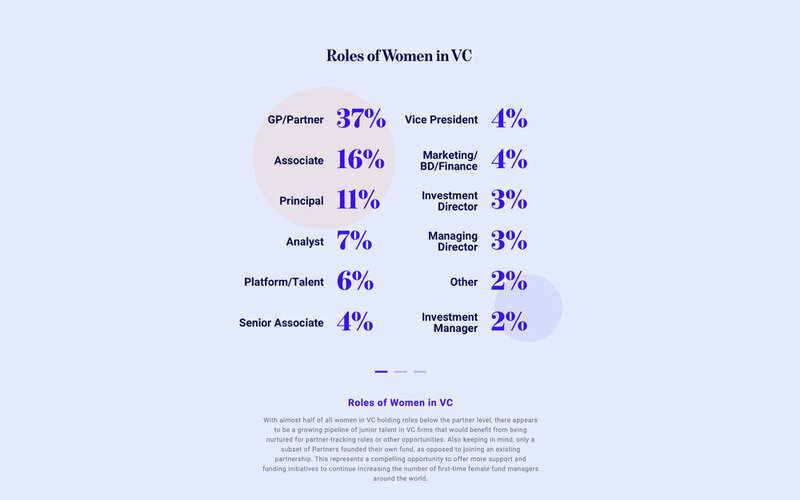 The website for Women in VC was built to support and strengthen the community of women who work in venture capital, an industry that has been traditionally dominated by men. We were excited by the organization’s cause and took on the project pro-bono. We felt that helping these women in venture capital might also help us get exposure and open doors for our recently launched studio that focuses on helping build and accelerate startups called 15 Finches. We created a unique color scheme that we felt looked modern and fresh, but also approachable and not overly feminine. The combination of serif titles and sans serif body fonts also creates a nice balance between the classic and traditional or between the friendly and efficient. In addition to branding Women in VC, we created a unique illustration style for the visualization of the database stats. The visuals and integrated quote carousels are the primary communication elements on the website that dictate the look and feel as well as the user experience. The site is designed as a single page long scrolling website with a navigation list of sections on the side of the screen that tracks where the viewer is on the page. The site is built with Gatsby.js, a React-based framework with Contentful as a content management system and Heroku as a hosting platform. When planning the development of the site, we had to consider which aspects of the site would need to be easy to update and accessible to the client. Given the large number of quotes provided by members of the network (100+), we decided to add and store them on Contentful and query them through Gatsby’s GraphQL integration to keep the quotes updated on the site as more entries are added. The compatibility of Contentful and Gatsby with automatic deployments through Heroku made managing, displaying, and updating this data a simple and streamlined process. More info about 15 Finches and our unique startup partnership approach can be found here.